This is an active 8-channel MIDI-THRU Splitter, which will convert 1x MIDI-OUT into 8x MIDI-THRU outputs that are amplified, isolated, and protected. 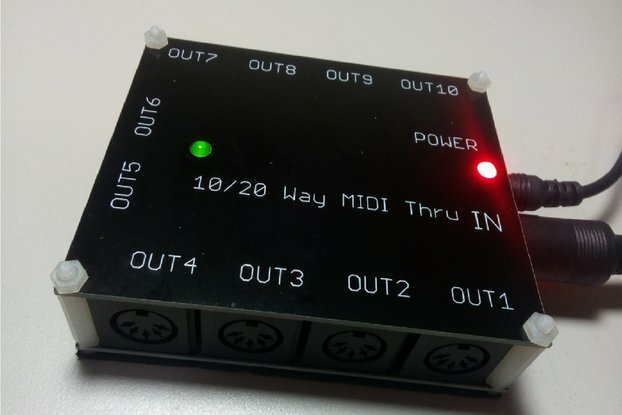 This 8 way MIDI Thru Splitter device outputs an exact copy of the input signal, so what goes in is what comes out of each of the MIDI-OUT ports, with NO DELAY. This device is a MIDI-STAR system that connects MIDI devices in parallel with NO LATENCY, avoiding issues associated with MIDI-Device 'daisy-chaining'. What you see is what you get. The 1U 19" Rack Enclosure with all systems assembled, tested and ready to use.